anatomical relationships, tooth hardness, gingival density and jaw articulation. Makes it possible to practice every aspect of dentistry including tooth extractions, periodontic and prosthodontic techniques, cavity preparation and routine cleanings. Radiopaque teeth may be visualized with X-Ray. 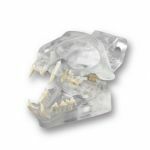 Consists of an upper and lower jaw with properly placed removable Ivorine™ teeth and a fully adjustable joint articulator. Gingival versions simulate the gumline and are ideal for subgingival exercises. anatomical relationships, tooth hardness, gingival density and jaw articulation. Makes it possible to practice every aspect of dentistry including tooth extractions, periodontic and prosthodontic techniques, cavity preparation and routine cleanings. Used by DVM's, Vet Tech and anatomy instructors, veterinary students and other animal care professionals. May be used as educational and instructional aids for service organizations, e.g., ASPCA, shelters, community animal organizations, staff training, and support groups for public instruction. Size: 8" x 4 1/4" x 4". No stand or keycard. Brand new. In original factory packaging. Made of durable, hi-impact plastic materials. Note: We offer a broad line of Vet charts and models including Canine Skeleton, Musculature and Internal Organ charts, the complete Canine Skeleton, Canine Knee, Canine Pelvis, Canine Elbow, Canine 5 pc Vertebrae, Canine Heart (with heartworm), Canine Jaw (with teeth), Feline Jaw, Canine Ear (a two sided model showing a normal and an infected ear) and the new Canine Shoulder, LFA # 1075. 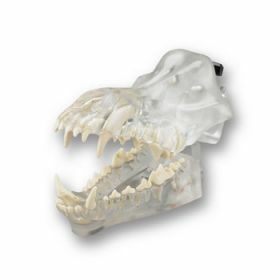 Veterinary and Student Discount on Set of 5 Anatomical Models including Canine Ear, Canine Jaw, Canine Pelvis, Canine Heart and Canine Knee.